The Tax Cut and Jobs Act of 2017 established “Opportunity Zones” as a new federal tax incentive to encourage long-term investment in certain-low income census tracts through investment in “Opportunity Funds.” This program does not require municipal resources or oversight. During this past spring, Governor Kate Brown and Business Oregon sought public input for communities across the State of Oregon to nominate qualified census tracts as determined by the Tax Cut and Jobs Act of 2017. Of the 366 eligible tracts, the state could nominate no more than 86. 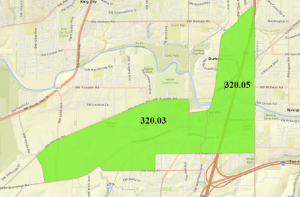 The City of Tualatin’s Economic Development Division, in addition to other community partners, submitted all eligible census tracts within Tualatin: 320.03 and 320.05. Tualatin’s Economic Development’s recommendation for both census tracts focused on close access to transportation infrastructure, each tract containing large portions of basic and non-basic employment sectors, and proximity to quality of place with shopping, dining, and outdoor recreation. Over the coming months, the Department of Treasury will outline further key requirements of how these Opportunity Zones and Funds are to be administered. An Opportunity Zone are those census tracts with a poverty rate of at least 20% or with a median family income that does not exceed 80% of area median income. An Opportunity Fund is at least 90% of an OZ holdings to take: Direct ownership in business property that the fund essentially runs itself, or Equity stake (company issued stock or partnership interest) in qualified opportunity zone businesses.